How do solar panels work? - what are solar Pv panels made from ? Solar Photovoltaic (PV) panels are made up of multiple PV cells. Cells are semiconductor devices which convert the energy from the sun directly into electricity. The heart of almost all semiconductor devices is the PN junction, the junction between negatively charged N-type material that has a surplus of electrons, and positively charged P-type material that has a deficiency of electrons. When photons of light strike the junction, energy is imparted to the electron and it is released to be able to flow as electrical current. There are two electrodes that make electrical contact with the cell. The electrode on the top surface is made up of very fine wires. It must contact as much of the N-type material as possible but, it also must minimize blocking the light photons. The bottom contact is a solid foil-like conductor. Because electrons reside in the N-type material, the thicker the layer of N-type material (usually silicon) the more electrical potential a cell will have. But, because the N-type material is the side of the cell that is exposed to the sun, as this layer gets thicker, fewer photons of light will be able to penetrate to the PN junction (Fig. 1). 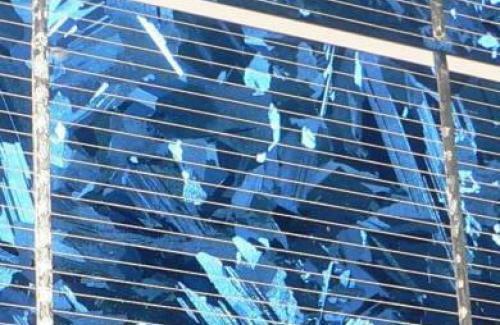 Monocrystalline PV cells are sliced from a single, homogenous ingot which has been drawn slowly from molten silicon. This gives the cells a dark, uniform appearance (Fig. 3). Cells are then cut into squares to maximize the surface area when connected together to form a panel, and the conducting layers are applied. Many PV manufacturers, including Conergy and Schuco, are publishing module efficiencies in around 15% for both mono and polycrystalline panels of comparable designs. Polycrystalline cells are sliced from an ingot that has been made from casting many silicon crystals together. This gives the cells a multi-faceted appearance. 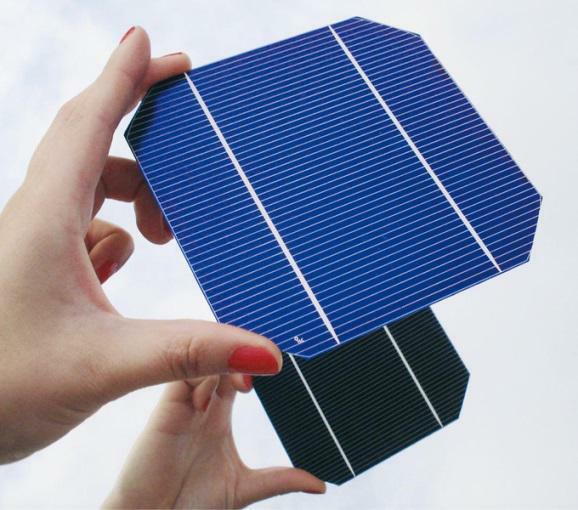 Polycrystalline and monocrystalline PV panels are, together, the workhorses of the Solar PV industry, being used in all aspects of the industry from large solar farms to off-grid homes to mobile, self-powered applications such as traffic signs. They both come complete with their own structural frame which makes the task of mounting them easier and cheaper. Both monocrystalline and polycrystalline panels have a high power density, compared to other options in the PV industry. They are a good choice for roof mounted arrays where space is at a premium. Thin-film cells can be made of a layer of amorphous silicon or other materials such as cadmium telluride. The layers are very thin because they are made using a vapour depositing process that results in layers much thinner than those used in mono or poly cells. Because the layer of silicon that the light photons must penetrate is thinner, thin-film cells have a higher efficacy when the sun?s radiation is weaker such as during cloudy, overcast conditions or in seasons where the sun is lower in the sky. The trade-off is that thin-film panels have a lower power density, meaning it takes more surface area of this type of panel than mono or poly panels to make the same amount of energy in good conditions. A characteristic of thin-film panels for commercial power generation is that they are often made without a structural frame which increases the time, difficulty and cost of mounting them. This additional cost offsets the savings achieved in the manufacturing process. Amorphous panels are used almost exclusively on solar farms where there is no limitation on the size of array. Thin-film cells are flexible and can be made into flexible panels and fastened to curved surfaces with adhesives. 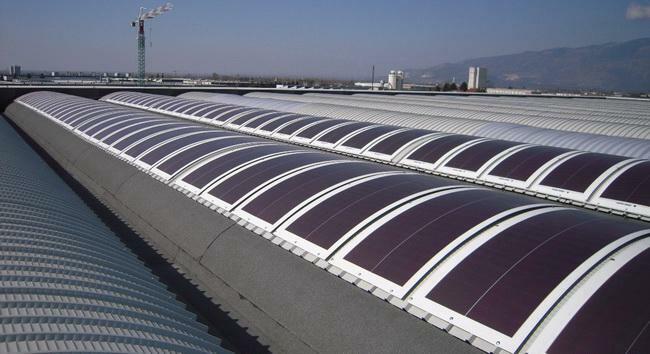 Thin-film panel?s flexible characteristics make it a good choice for Building Integrated PV (BIPV) applications, for flat membrane roofs or sloped steel roofs. Flexible thin-film panels are also seeing a surge in popularity for Recreational Vehicles and the sailing community. Most research in the solar industry is focusing on improving existing technologies in mono or polycrystalline cells. Another focus is on concentrating solar radiation on fewer cells in an attempt to reduce the overall cost by replacing expensive PV cells with cheap reflectors or Fresnel lenses. But most companies trying this have been unable to overcome the loss of power from PV cells as the temperature increases. A new technology that is winning awards is attempting to use ?organic solar cells? following the lead of Organic Light Emitting Diodes (OLED?s) in the LED and television industry. The cells are reported to be 1/10th the thickness of a thin-film PV cell, making them virtually transparent. The transparent property of the new cells allows them to be used on window surfaces, absorbing some of the sun?s radiation before it has a chance to penetrate buildings, often adding to the air-conditioning load. However they are so transparent that it will not affect the clarity of the windows. However there are currently no commercial products available.